It has been a while since I have posted on this site, but things are about to change. Last night I was on a panel for a PhD course called “Having an Impact” and this morning I had a really nice conversation with someone who was asking about blogging. Both encounters reminded me of the importance of sharing information and ideas through this and other media. So here I am, taking it up again. The first thing I want to share is the results of the Evaluation of the Civil Society Mechanism. 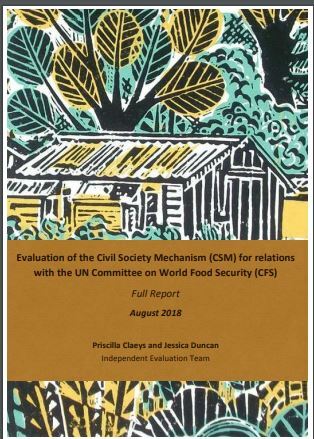 In the summer, Priscilla Claeys and I completed the evaluation and it was shared in October with the Committee on World Food Security. The Evaluation assessed how the CSM has been functioning in line with its founding document, guiding principles and mandate along the following three key dimensions: internal dimensions, external dimensions, and the role of the CSM in relation to the future of the CFS. We made use of qualitative data collection, namely semi-structured interviews (45) and an online survey in three languages (82 respondents from all constituencies and all but two-regions). Data collection took place between March and June 2018 and was complemented by a strategic review of CSM and CFS documents. Recommendation 3: Develop quotas to enhance youth involvement in the Coordination Committee and Working Groups. Recommendation 6: Consider asking for a financial contribution from self-funded participants to support the attendance of under-represented participants and enhance the inclusiveness of the CSM space. Recommendation 7: Continue to develop and implement guidelines and strategies to streamline and clarify CSM processes. Recommendation 9: Develop a strategy to increase the institutional memory of the CSM Working Groups, assigning clear responsibilities for this task and laying the ground for efforts towards the use, application and monitoring of CFS outcomes. Develop protocols, including leadership strategies, to support the transition from policy to implementation. Recommendation 10: Develop communication pathways, or feedback mechanisms, between the Working Groups and the Coordination Committee to ensure political coherence and focus. Recommendation 11: Consider devoting more time in Coordination Committee meetings to developing a political strategy outlining clear priorities and areas of focus.